Whole game is broken now, we can all go home. But honestly this reminds me a lot of doomsday. Since most of vintage is cantrips anyway I have to believe there must be some sort of play this, win the game on the spot combo I am not thinking of. Any spell that gains life for mana is free off the top with this and it can cast things like Hypergenesis and Restore balance for free. At the least this may lead to some fun home-brews if the 6 CMC does not kill it. I love that card! Futuresight-esque effects have always been one of my favorites, and this one can be tinkered for. Definitely going to try to make that work in a stormy shell. EDIT: It's also bizarre that you need a small storm-count to kill with this. You can possibly even play. You only need 5 storm to deal 10 with Tendrils and then this deals the other 10. I guess if you go very light on land, heavy on moxen and moxen like objects, maybe even run land grant in a style similar to beltcher lists, and maybe eve spells that gain life that are more than their mana cost it is not inconcievable that this card isn't just the love child of ad nasuem and yawgs bargian. My fear is how long the turns are going to take when top is involved. Vintage players can complain about everything it seems. Top + this card is literally Yawgmoth's Bargain if you want it to be. Tap Top, draw a card, pay 1 life to cast Top... How long do Yawgmoth's Bargains turns take? It's actually a strictly better Yawgmoth's Bargain as you are not going to draw your Moxen (or your one land drop) - you are just going to cast them. So instead of draw 13 cards with Bargain, you are instead drawing 16 or 17 cards for the same amount of life. Assuming drawing cards is even what you want to be doing. You could just cast a Dark Petition off the top, still get the BBB to cast Will, then do Will things. You don't even need to run Tendrils if you don't want to. 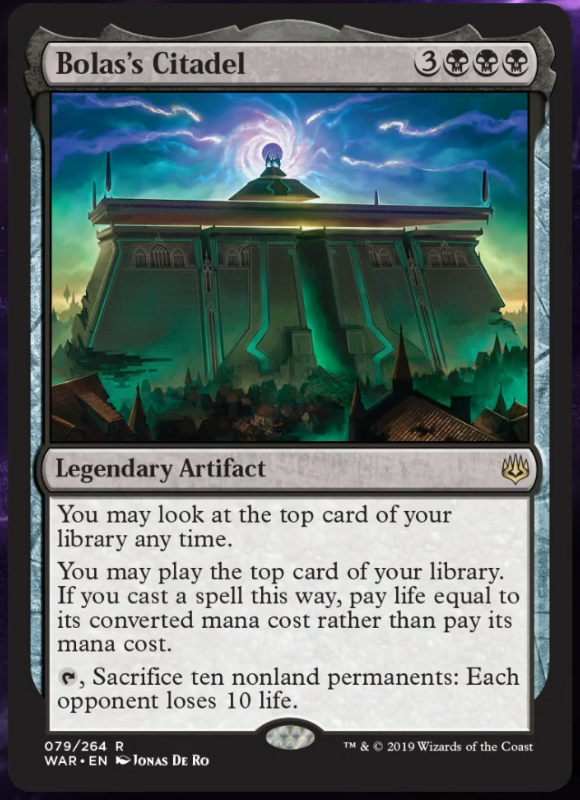 Just sacrifice 9 artifacts and Bolas's Sanctuary, then Will them all back to do it again. I don't think this card is going to break Vintage. It's stopped by Grafdigger's Cage and Lavinia, Dacking one is going be hilarious (saccing Elementals to the -10 ability? ), and Sphere's still affect the ability to cast spells. But this is WotC pushing the envelope, printing cards with potential combo applications, and has a powerful and distinctively Vintage feel to it. Kind of wish all the people who complained ad nauseum about Cindervines and Lavinia would come back and contribute in a positive manner with discussions, interactions, and deck ideas. Since apparently WotC prints cards other than asymmetrical hate pieces. Easily my favourite card revealed so far. Definitely will try a storm-y shell but it might not necessarily even need Rituals in the same deck. I've always loved Future Sight as a card, and now we have one in black that also let's you cheat on mana. Definitely pushing the envelope with this one and I'm liking it. Comedy option of using Drafna's Restoration to get all your artifacts back exists. If they are all moxen, putting them on top of your library accomplishes the same thing more or less. Anyway, the fact that we legitimately have a card in standard that might compare favourably with actual Yawgmoth's Bargain makes me unbelievably happy. This is also a Tinker Target that I think might just trump Memory Jar in a Ritual list. This seems cool with Aetherflux Reservoir. This card seems pretty broken, but its also costed highly enough that it has a lot of competition and is unlikely to really destroy the format. Interesting with things like Fastbond and Aetherflux Reservoir so that you can play your entire library in one turn. What a sweet card. Maybe it's time for Mishra's Workshop and Dark Ritual to bury the hatchet and join forces. At least, that's what I'll be trying. Failure or not, I can't wait. I think this cards claim to fame is going to be a tinker 1 card win on the spot build simply because it does not need anything else to go off, unlike blightsteel which needs timewalk or Vault which needs key. You can maybe run Defense grid too if you wanna get crafty/combo-y. I doubt the tap ability is going to be its claim to fame, since it can just play tendrils off the top and win. I personally love the thought that this card can enable jank like Rest for the Weary to be a combo piece though. I'd even consider Noxious Revival and Transmute Artifact, but maybe it's too cute. Anyone knows how this works with X spells? I mean, from the text I gather that if I play a Fireball for 10 I'd have to pay 11 life, but I can do it, right? X will be 0 if you use the alternate casting cost. This card is unplayable in a creature heavy format such as vintage. Imagine playing against Shops or dredge or Xerox. A Storm deck is trying to win on the last turn possible, with 5 life. You’d be better off with Form of the Dragon. I think I'd rather have Bargain most of the time. I'd be worried you end up with a land on top that you can't play and be stuck passing the turn. Even with tutors and plenty of fetches, it seems not reliable enough. Works well with Top, sure, but that's extra slots you need to use, and it's vulnerable to Rod and Misstep. Aren't people already playing some number of top in PO. Aren't a lot of PO decks running tinker? Why wouldn't i just add this into my PO deck as another way to draw 6+ cards? @garbageaggro Because when you topdeck this instead of tinker, or tinker this and don't have top, it is gonna hurt. If you're hardcasting it, you may as well hardcast bargain for 1 less black mana and draw 15 regardless of top in play or if you hit a run of 4 lands. I could maybe see some workshop cheatiness though. Lotus, workshop, this - cast a crapload of 0 and 2 drops for 10 life and just be in an unbeatable position? It's not very synergistic with foundry inspector if you are casting off the top though (and FI is just nuts in multiples in that deck). This is not Bargain because Bargain doesn't generate mana. If you hardcast Bargain you have 6 less mana this turn. If you hardcast this you only care about life. The fact this goes infinite with Aetherflux Reservoir or Top is also very important, as is the fact this suffers from artifact removal and Dack. I wouldn't play this in PO because of the triple black though.